Many people in the world have found themselves in the smoking habits, even before they realize it. Smoking is a cross-gender habit, which affects both the old and the young. Most smokers end up smoking as a result of some pressures in their lives. After smoking for some time, people try to quit to no avail. Indeed, smoking has many disadvantages, yet there are some advantages, but the problem is how to help smokers to quit. Smoking influences smokers, as well as the people around them not even mentioning the environment. Millions of people in the world who smoke are ignorant of the effects of smoking on their health, environment and other people around them. Smoking is among the top causes of deaths in the world and the United States. America loses each year, approximately three hundred and ninety-three thousand people due to smoking. In the world, approximately five billion people die each year from smoking. Most of the deaths result from preventable diseases, which are caused by smoking. Smoking begins at an extremely early age, mostly at the illegal age. In this research, was found that in a group of eleven individuals, only one started smoking at a legal age. One of the eleven started to smoke at ten while all the rest started at teen-age during high school. Starting to smoke at an early age leads to high level of the harmful substances from cigarettes accumulated in the body. These alarming death rates can be reduced by raising awareness about the dangers of smoking. Secondly, smoking causes morbidity and premature deaths. Smoking during pregnancy leads to deformities in the unborn child or even to death. Research shows that smoking during pregnancies accounts for approximately thirty percent of low-weight births. Children born to smoking mothers weight less than two kilograms at birth. Roughly, fourteen percent of preterm births are attributable to smoking during pregnancy. Ten percent of total child deaths are attributable to smoking mothers during pregnancy. In addition, smoking mothers give birth to full term normal weight healthy babies with reduced lung functions and narrow airways. Such children are at high risk of breathing complications. The birth of abnormal or unhealthy children from smoking mothers clearly shows that smoking affects not only smokers but also those living around them. Thirdly, most forms of cancers are attributable to smoking or cigarette smoke. Cigarette smoke has around 7000 chemicals with sixty-nine among them known as carcinogens. Smoking is directly attributable to more than ninety percent of lung cancers. The fact that cigarette smoke goes beyond the smokers to the environment, smoking may lead to a small percentage of cancer deaths among non-smokers. As I noted in my research, when I started smoking after a break-up with my girlfriend, my friends who were with me most of the time in high school inhaled the cigarette smoke. Beyond the fact, they also started smoking from influence since they had inhaled substantial amounts of smoke, which could affect their lungs. People living with smokers are at high risks of suffering from cancer just as smokers do. The cancer of the esophagus mostly affects smokers more than non-smokers. People should smoke in the smoking huts to prevent the smoke from penetrating into the environment since it poses a danger to non-smokers, who inhale it. Fourthly, smoking leads to economic expenses in treating smoking-related diseases, and low productivity among people. Majority of people succumb to smoking-related diseases during their productive years, depriving the world of skilled and energetic labor. With close to five million people dying every year from smoking, the world loses a lot of skilled labor, which could enhance the world economy. 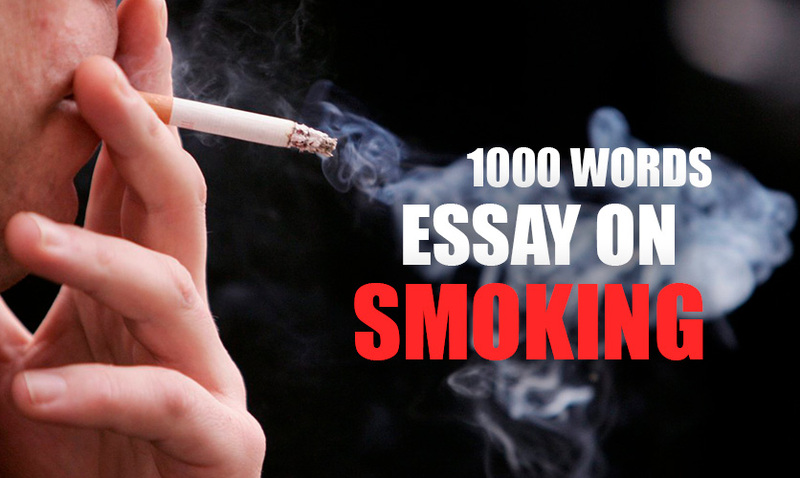 A research carried in 2004 revealed that the USA lost 193 billion to smoking-related expenses. Ninety-three billion were relating to lost productivity while ninety-six billion were relating to treating smoking-related diseases. One hundred and ninety-three billion in one year is a lot of money that can be put into more productive use. This is a statistic concerning one region in the world, implying that each year the world loses huge amounts of money to smoking. If people start smoking at the early age it contributes to their health complications related to smoking. Even after quitting people who started smoking at an early age remain at high risk of lung complications, as well as other smoking-related diseases. This happens because chemicals within the cigarettes had already damaged body parts of the smoker. Therefore, it is important to work out means that will ensure young people do not engage in smoking. Working out a way of avoiding is simple than helping smokers quit smoking. In conclusion, smoking is a leading killer in the world. Apart from the direct deaths of smokers, smoking affects other people, as well as pollutes the environment. Apparently, smoking mostly results from undue influence at teen-age, or from pressure in early adulthood. To quit smoking is challenging, but for those who does it successfully, it is a triumph. Resources ought to be employed in high schools to advocate a non-smoking generation. Such efforts will save millions who would have fallen for smoking due to different reasons. If the world invests in ways of saving people from beginning smoking, then it will be saving millions from death. Such initiatives will also improve the world’s economy since capital used in the treatment of smoking-related diseases will be put into more advantageous use. Notably, saving one person from smoking will not only safeguard that person’s health but those people who are around. Since smoking most affects males, there is a dire need to come up with recreational activities that will engage them to reduce the possibilities of smoking. In addition, as people are lured to quit smoking, it is important to come up with facilities, which will help them live the healthy lifestyle. At teen-age, when most people start smoking, it is the responsibility of the parents, teachers, clergies, and society as a whole, – to ensure teenagers and young adults do not engage in smoking. You can write the same essay if you would follow this effective guideline on writing 1000 word paper!